Mister Rogers arrives with a small box he was given by Mr. McFeely on the way in. After singing B-O-X Spells Box, he opens the box to find that it is filled with rabbit food and shares a film about animals eating different kinds of food. Mr. McFeely arrives with a few rabbits in a cage. He and Mister Rogers feed the rabbits as they talk about how each one is different. In the Neighborhood of Make-Believe, Daniel Striped Tiger is checking the gears inside his clock to be sure everything is working properly when Dr. Marchl stops by. Daniel directs him towards the Platypus mound where Dr. Marchl meets Dr. Bill and Elsie Jean. At the castle, everyone gathers to open the box left by the Wizard of Luvovich. When the box opens on its own, they find a pair of pretend bunny ears and a note that says "To help you hop." When Lady Aberlin puts on the ears, she continues to hop until the ears are removed. Everyone else takes their turn with the ears and enjoys a fun hop. 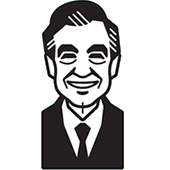 Back at the house, Mister Rogers talks about a people making their own decisions about what they will do -- wishing or wearing a special cap cannot make a person do something. He concludes by singing You've Got To Do It. Upon his arrival, Mister Rogers mentions that he has been thinking a lot about wizards since last time.